If you have a son who can take care of keeping your garden beautiful—cutting grass and weeding—you can to give him the full responsibility to do it. Not task. Responsibility. Make him his own boss. Define standards, but don’t supervise him. 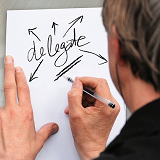 Make a list of responsibilities you could delegate. Make a list of people who could take the responsibilities. When you give the full responsibility, define standards and make the person his own boss. Don’t supervise him.